Are you a boy or a girl and are between 11 and 16 years old? 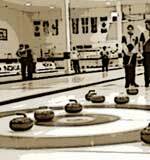 Are you interested in Curling? Maybe one day you will be in the team of curlers that represents the Czech Republic at the Olympic Games for the first time. Come and be part of the best club in the history of Czech curling!